In a moderate wrosswind, Chris and I took off from FCI in trusty ol' N12902, a Cessna 172, and headed southwest to W81, Crewe Muni. I'd never been there before and despite studying the AFD didn't know quite what to expect. At 2000 feet Our airspeed was about 120 mph (it's an older 172), but the GPS said the ground speed was only 90 knots, or about 104 mph. The higher we went, the stronger the headwind, so we stayed low. The runway is 15-33, the same as at FCI, but only 3300 feet, so there was a ninety-degree crosswind, and I was just slightly concerned about getting down safely. There was no reply when I called unicom, and there was no traffic. We flew over the field at 2000 feet (just inside the Farmville MOA, which goes to 1500 AGL over the field), trying to spot the windsock. No luck. I dropped down and entered the pattern, still not knowing the wind, but we never did see a windsock. Then I noticed that the runway appeared to be on a slope, although the AFD hadn't mentioned it. Hoping that the wind was still across the runway, I decided to land on 33, which was uphill. I was a bit high and fast--my eyue fooled by the short and narrow pavement--but managed to set up a reasonablly stabilized approach and landed without incident. We taxied to the uphill end of the runway, pulled off in front of the hangars, and then back onto the runway again, this time pointing downhill. We still hadn't found a windsock, so just to be sure in case we'd be taking off with some tailwind, I locked the brakes and got the throttle wide open before taking off, but we had plenty of room, and the crosswind wasn't any trouble. 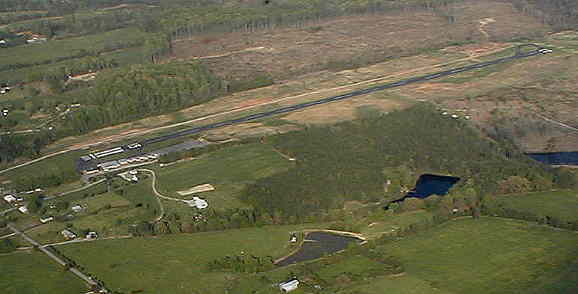 From there, we flew to Dinwiddie County Airport, PTB. (It used to be Petersburg.) 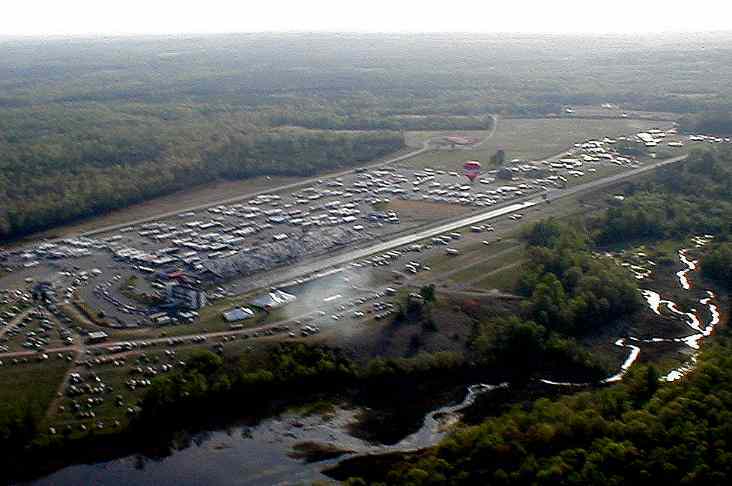 We circled over the Southside Speedway, the drag strip just southwest of the airport, trying to see the grand national drag cars that were racing there this afternoon. But from 3000 feet we couldn't see much, so I came down and entered the pattern to land. As we were taking off from runway 23, heading toward the speedway, we spotted a hot air balloon at about 300 feet, drifting directly toward the airport. The smoke in the photo is from the two drag cars that are just ending their run--black specks near the end of the shiny portion of the dragstrip. Soon the balloon pilot was on the radio, announcing that he was going to land on the field. We didn't stick around to watch, however, but flew north to FCI, landed, and called it a (nice!) day.